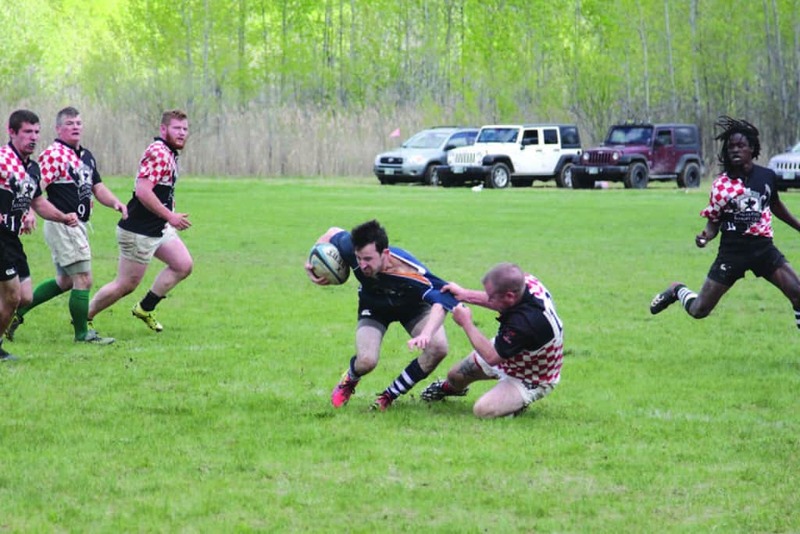 On Saturday, May 6 in West Rutland, rugby fans from all over the state descended on a field outside of town for a day of hard tackles, mooseburgers and fundraising for a good cause. The event: The Keith Page Memorial Rugby Invitational. Rugby, the raucous cousin of what we Americans call soccer, originated in 19th century England in the “market town” of Rugby, Warwickshire. A student at a public school named William Webb Ellis broke the rules of a game of football by picking up the ball and running with it. The sport caught on and today, rugby follows soccer (known everywhere else in the world as football) as one of the most widely played sports in the world with highly competitive teams in South Africa, New Zealand, Australia, Ireland and the United Kingdom. In 2016, the rugby community celebrated as their sport returned to the world stage as part of the 2016 Rio Olympic Games. And it’s found a home in Vermont with teams throughout the state. While not every school has a sanctioned team, many offer it as a club sport at the local or collegiate level. Rules are referred to as “laws” and the referee is to addressed as “sir” at all times. Only one captain on each side may speak to him. Players and coaches all elaborated stories about a culture of loyalty and comraderie that comes with the game. “Thanks to these guys, I’ll never have to worry about getting help moving,” Kyle Thompson, a player with the Black River Rugby Club. By the end of the day, the Rutland Rugby Club battled their way to the to the top. Teams from Bennington, Ludlow, West Lebanon, and Keene, New Hampshire attended to tournament, which raised a total of approximately $2,000 for the Rutland County Women’s Network & Shelter. Rutland rose through three games, beating the Black River Rugby club 7-0 and tying with with Monadnock Wolfpack Rugby to advance to the final. The last time Rutland played Upper Valley in the fall, they suffered a devastating loss. The final game’s win the first time the Roosters won the tourney in four years. Disclosure: Maxx Steinmetz is a former graphic designer for the Mountain Times. Rutland Rugby Club member Jeff Whipple drives an Upper Valley player to the ground in the tournament final.